Campers should avoid the visiting the Chattahoochee-Oconee National Forests during until the danger of extreme weather subsides. 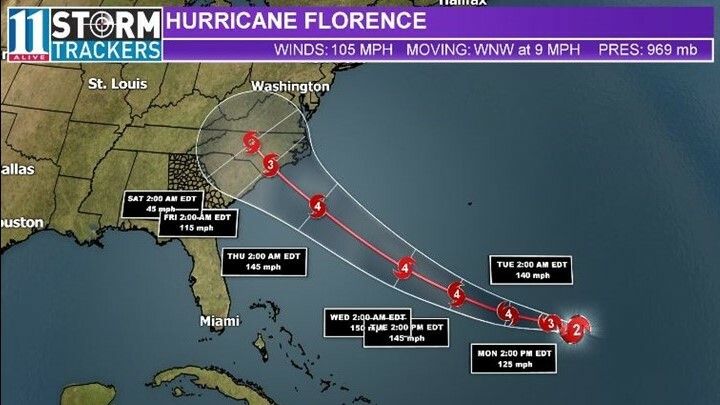 GAINESVILLE, Ga. – Chattahoochee-Oconee National Forests is closing some campgrounds and recreational areas directly in the path of Hurricane Florence on Friday. The low-lying sites will remain closed until Florence passes and the sites are safe for visitors, the Forest Service said. Campers should avoid the visiting the forest during until the danger of extreme weather subsides. Emergency responders wan they might not be able to respond quickly to those areas because of the potential for extreme conditions. Excessive rain and high winds from Florence could create high water, flash floods, falling trees, mudslides, and severe damage to roads. The list may change depending on conditions. For more information, you can visit www.fs.usda.gov/conf. ► App and mobile users, please tap here if you cannot see the image above. ► RELATED | Understanding Severe Weather: What's Moderate Risk, What's High Risk?